A setting chosen in 2013 by the producers of the hit reality TV show, “Survivor”, Caramoan is a first-class municipality in Camarines Sur, Bicol, Philippines. And it is definitely an adventure-seeker’s dream paradise! Tourists can get lost in its numerous islands with powdery sand, coconut trees, crystal clear waters, the beaming sunshine, and more. #1 - Matukad Island: Never miss this magical island when in Caramoan, Bicol, as it has fine white sand, crystal clear blue waters perfect for swimming, friendly locals, a cliff worth climbing due to the lake up there that is guarded by a pretty milk fish, stunning shoreline excellent for a stroll along with fun photo shoots, etc. #2 - Residencia De Salvacion: Located in Sohoton, Barangay Paniman, this is not a luxury hotel nor a resort, and yet can give you comfort, fun and relaxation through their simple accommodation, entertaining island hopping adventure (Matukad Beach/Lahos Island/Cagbanilad Beach/Minalagos Beach/etc. ), Filipino/Bicol yummy meals, exemplary customer service, and many others! #3 - Tugawe Cove Resort: Located in Barangay Colongcogong, this resort will give you your well-deserved rest after exploring Caramoan’s natural scenic spots nearby (Manlawi sandbar/Lantanganan Island/Patag Bay), with their very rejuvenating cabana-style hotel rooms that have the all the important amenities as well as internet access to keep you connected to the world even while you are “away from it all”; in addition to all the mouthwatering dishes/drinks available at thrilling RestoBar, plus other amazing stuff, you just can’t get enough! #4 - Gota Village Resort: This resort is the only resort where the international hit TV series, “Survivors” is filmed. It truly is a tropical paradise worth visiting. 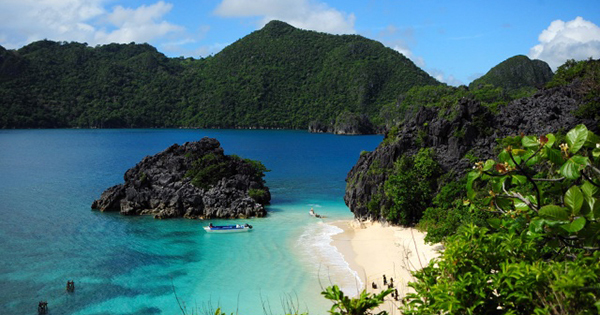 Caramoan can be reached via land through the Southern Luzon Express Way or by plane ride from Manila to Pili Airport. Consequently, contact the CamSur Tourism Office to organize easy transport transfers when going to Gota Village Resort. #5 - Lahos Island: Welcome to Palawan-like Lahos Island! What with its phenomenal powdery white sand, lush surroundings suitable for picnics/lounging, awesome rock formations, crystal clear blue ocean so ideal for exciting swimming, total serenity that’s so heavenly! You can opt for booking at a nearby hotel that will arrange a boat ride for you to the area; otherwise join packaged tours for more convenience and optimum good time!